Aidan Hood. Journal file photo by Marvin Gentry. Alex’s Lemonade Stand was founded by Alexandra Scott in 2000. Scott had been diagnosed with pediatric cancer at a young age and wanted a way to help raise money for other kids who were facing the same situation. With the help of her brother Patrick, her first lemonade stand raised $2,000, and by the time she passed away in 2004, she had raised more than $1 million for the cause. It was then that her parents began the Alex’s Lemonade Stand Foundation, which has grown to the point that people all over the world use the method to support the same cause. 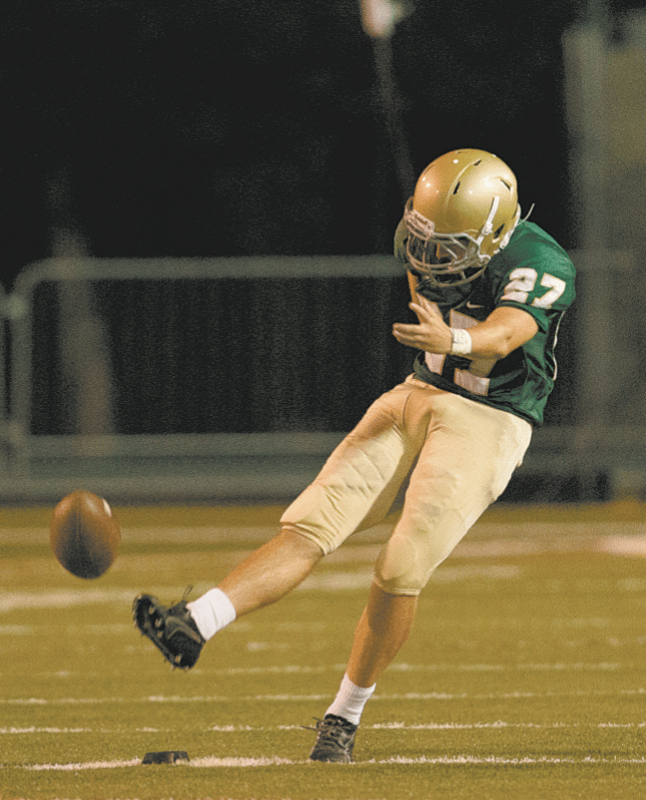 After visiting the Kohl’s Southern Showcase in Atlanta, Mountain Brook High School senior placekicker and punter Aidan Hood discovered the foundation and his own path to helping the cause during the upcoming season. Pediatric cancer has affected the Mountain Brook community in recent years, and students such as Hood were touched and have remained committed to the legacy of peers who have passed and to assistance for peers who still battle the disease. Hood recalls the life of Sid Ortiz, who passed in 2015 at the age of 16, and his close friend Sean Fredella, who has beaten the disease multiple times. Since the foundation began in 2005, more than $150 million has been raised for pediatric cancer research. That money has funded more than 800 research projects at 135 institutions, including the University of Alabama at Birmingham. It has also created a travel program to help support families of children receiving treatment. It also funds resources such as the SuperSibs! program, which is dedicated to comforting, encouraging and empowering the siblings of pediatric cancer patients during their family’s battle against childhood cancer. When Hood returned from the Kohl’s Southern Showcase, he approached coach Chris Yeager for his support. This season, Hood has set a goal of $5,000 to raise for the foundation. To join his journey by donating, fans can visit alexslemonade.org and search for “Kick It! with Aidan Hood” at the top of the page. He’s optimistic about the upcoming Spartans season, so he should have plenty of chances to earn the points on the field to translate to donations. Hood recently received his first collegiate offer from Rhodes College, and he’ll continue to explore his options for 2019 as the season progresses.